I fully expected to be underwhelmed at best and left cold and irritated at worst by Dil Dhadakne Do, mostly because the further in time I get from Zindagi Na Milegi Dobara the less I care about it. When I went back and read my review of it from four years ago, I realized I'd say most of the same things about this film, except that the problems I had with ZNMD—I didn't care about the characters, they navigate the world too easily, the women aren't written as fully—are handled much better in DDD. 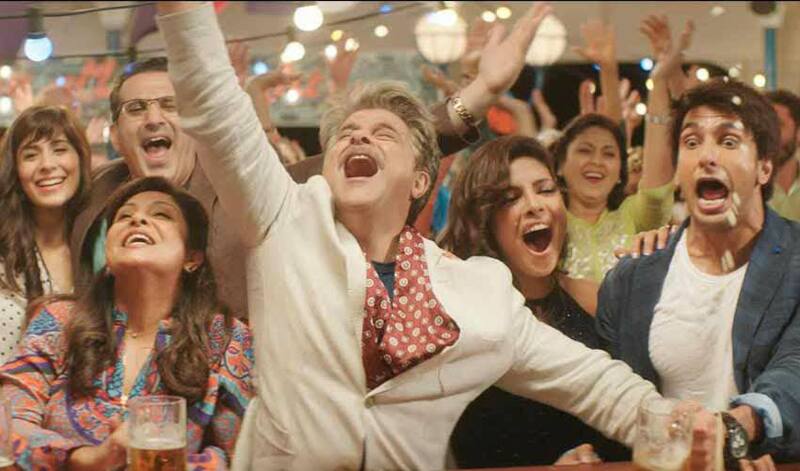 If Zoya Akhtar wants to make largely the same movie a second time, at least she much improves on it*, which is much more than can probably be said for someone like her cousin Sajid Khan. First off, I really appreciate the casting. Everyone is a sensible choice and everyone does well. Sure, some actors more to do than others, but those with meat make the most of it, especially Ranveer Singh, without whom I would have been far less entertained and attuned. And like a few other good directors before her (Vishal Bhardwaj, Anurag Basu, Omung Kumar), Zoya gets a strong performance out of Priyanka Chopra. Pip pip! Also deserving of special notices on this blog is the impressively non-irritating on-screen Farhan Akhtar! I had no idea I could so fully like him as an actor, but here we are. Plus his character is likable and useful. Coupled with the writing, the performances mean that I believe these people and I care about them. For me, this film has the right proportion of lesson-learning and loose ends. There is still a lot of work left to do when the film is over, but we have the sense that these people can and will actually try, and I think any more tidying up would have felt too easy and would have diminished the emotional heart that is the central family. I said to my friend as we left the theater that I was hoping for a little "one year later" summary for each character while the credits rolled, but actually, that would have been facile, and the film equips the audience for making up our own minds based on what we've learned of these people. We know, as does everyone in his world, that Anil Kapoor is a self-made businessman, and thanks to the final action sequence we can feel cautiously optimistic that he will similarly energetically address his family's emotional needs and their recovery from a decade of bad decisions and unhappiness. Zoya and co-writer Reema Kagti trust their characters' potential, and so do I. However, I do worry for Shefali Shah's character, because I think she was stung the most in all the truth-telling, as well as left with the least clear new path, and that is a formidable wall of aunties she hangs with, and I can't really see them being inspired to cut their gossiping or her quickly learning to stop caring what they say. As Priyanka points out to them, they really need to find something better to do, but as they admit about themselves, what else do they even have in their lives, so how could they go about changing? She has the harshest treatment in the film's examination at the effects of choices; like so many women she is clearly crucial to her husband's success in the business world but has nothing she can claim as hers and, at least in her mind, no skills she could use in any other setting. In the world as she knows it (which is not the same as how the world is to outsiders, of course), she really is stuck. Perhaps the best thing about DDD is that everyone is called out on their hypocrisies. The faults, the trauma, and the suffering are equitably distributed among the central family and their world. It's not just that each of these people has flaws —it's that they acted otherwise while accusing others. As Pluto says, we each find pretentiousness annoying in other people. Our habits and our fears, not particular individuals, are the villains. But: that darn dog. His setup comparing people to other animals lasts just the right amount of time (with the ship being their prescribed habitat in the zoo that is humanity, I guess? ), and he certainly has some truthful insights, but maybe they could have been just as effective coming from a human, such as the pre-teen daughter who sits quietly but clearly observes everything? I do love Pluto's empathy and physical presence (as reminder of important values and people), because those are things a dog can actually do. Despite being a dog person my whole life, I really don't need The Voice of Dog, the Moti the Emotional Wonder Dog in actual words. But I'd still rather have a verbal dog than Manic Pixie Dream Katrina Kaif, know what I mean? * Except for the songs, which are similarly forgettable and unconvincing, except for "Girls like to Swing." I'm kinda sad the one-take-song idea is wasted on a sequence that for mainstream big-budget Bollywood is underwhelming, dance-wise. I read this late, but oh, your take so much matches mine. You are one of the very few (maybe the only one besides me in real life, not critics) who found Priyanka Chopra's role good and well-acted, Ranveer being the reason for sitting through at a lot of scenes and you do not hero-worship Farhan Akhtar. Thanks, I was starting to doubt myself. I thought Shefali Chhaya's role had more layers than others - she, as you mentioned, is an ally to her husband's manipulative moves, tries to get back at him by fighting for things she really does not care much about (dinner table argument about selling the plane, etc) and had me seriously thinking whether she actually cares for her children or has she given up because she is too bitter. Hi Aparna! Maybe we need a club for those of us who would rather Farhan Akhtar stick to behind-the-camera? I mean...he's fine as an actor, whatever, but I don't think he adds anything in particular that other actors cannot also do just as well. You make a good point about SHefali's character giving up. It's easy to imagine that she feel pretty ground down by her husband and his effects on their children. And I really want to know what happens to her after this film! Does she find herself some better friends and better ways to spend her time? I think I've seen all of Ranveer's movies except for Gunday, on which I bailed after 45 minutes because it is so terrible. I find him very charismatic and interesting to watch. Yayy to that club. I thought Farhan was fine here as it was such a short role but again, it could have been better with a different actor, not sure who, maybe Abhishek (yeah, I know Farhan is way more talented, but Abhishek does the guest appearances real well :) unlike his actual acting roles). Ranveer is probably one of the very few heroes who brings in a very "physical" impact, somewhat like what Akshay used to do in movies like Khiladi, Saugandh or any of the 80-90s movies before he went into all out comedy roles and became a "family man". Yes, would love to know what happens to Shefali's character post their cruise adventure. And how do Priyanka and Farhan get together - he being the traveling journalist reporting from all locations and she being the businesswoman, both of whom need to be at a certain location and who, seemingly, respect each other's professions.